Functional programming (FP) holds real solutions to today’s complex software needs, especially the challenges of parallelism. It’s catching on, but there are barriers to its adoption. FRP is a subset of FP that doesn’t require you to learn a new language. This makes FRP an ideal gateway drug to functional programming. FRP solves a specific problem now, yet it gives you grounding in ideas that have wide application. Lambda expressions have now been added to every language. The only thing standing in the way of wide adoption of FRP is gone. FRP is essentially an embedded logic language, so code written in it looks basically the same in any language. It turns out that Java has especially clear FRP syntax, and this was why we chose it as the pri- mary vehicle in this book, but the language really doesn’t matter. There’s a need for FRP, the languages are ready, and functional programming is in vogue. The time is right for FRP to take over a small corner of the world. Chapter 1, “Stop listening!” introduces the what and why of FRP and finishes with a simple example. Chapter 2, “Core FRP,” covers all the basics of FRP and includes a minimal example for each element except the switch and sample primitives (covered in chapter 7) and operational primitives (chapter 8). In chapter 3, “Some everyday widget stuff,” the examples become more practical. Chapter 4, “Writing a real application,” shows the practicalities of writing a real- world example—the logic for a petrol pump—entirely in FRP. At this point, you may be wondering why we’re doing things in this strange way. Chapter 5, “New concepts,” covers the theoretical background that justifies FRP’s radi- cal departure from the usual way of doing things. Chapter 7, “Switch,” introduces the switch primitive that enables the all-important capability of making runtime changes to the logic structure. Chapter 8, “Operational primitives,” deals with interfacing FRP to the rest of your program. Chapter 9, “Continuous time,” describes an amazing capability of FRP: modeling your system with continuously varying values instead of having values change in dis- crete steps. FRP is better for some tasks than others. Chapter 10, “Battle of the paradigms,” compares the strengths and weaknesses of FRP against classic state machines and the actor model to help you decide which tool to use for which job. Chapter 11, “Programming in the real world,” covers different ways of modeling I/O in FRP programs. Chapter 12, “Helpers and patterns,” presents an assortment of interesting prob- lems that come up and how to solve them with FRP. Chapter 13, “Refactoring,” explains why FRP is so easy to refactor by comparing an example with the equivalent object-oriented code. Chapter 14, “Adding FRP to existing projects,” recommends some practices for step-by-step conversion of non-FRP code to FRP. Chapter 15, “Future directions,” covers areas for potential development of FRP. This book is for programmers familiar with object-oriented programming. No prior knowledge of functional programming is needed. A familiarity with graphical user interface (GUI) programming is useful but not required. This book provides copious examples. Source code in listings and code terms in text are in a fixed-width font like this to separate them from ordinary text. In some places, we’ve added line breaks and reworked indentation to accommodate the avail- able page space in the book. When even this was not enough, listings include line- continuation markers. Additionally, comments in the source code have often been removed from the listings when the code is described in the text. Code annotations accompany some of the source code listings, highlighting important concepts. STEPHEN BLACKHEATH lives near Palmerston North, New Zealand. He has done a lot of event-based commercial programming, got into functional programming around 2007, and is the founder of the open source Sodium FRP system. He likes to play Go. ANTHONY JONES lives in Auckland, New Zealand. He has spent half a decade refactor- ing a Java-based configuration GUI to a FRP-based framework and is a contributor to the Sodium project. He likes riding his bicycle. 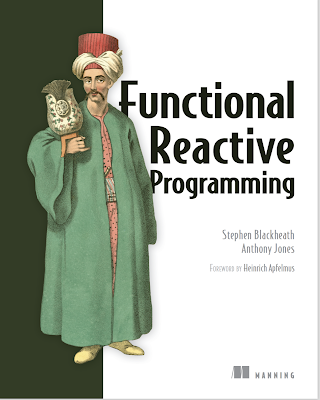 Purchase of Functional Reactive Programming includes free access to a private web forum run by Manning Publications where you can make comments about the book, ask technical questions, and receive help from the lead author and from other users. 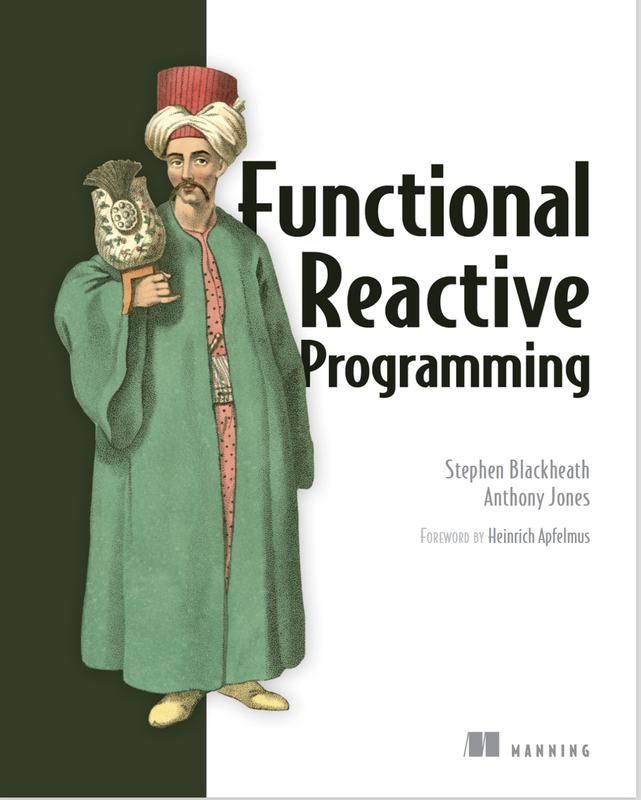 To access the forum and subscribe to it, point your web browser to www.manning.com/ books/functional-reactive-programming. This page provides information on how to get on the forum once you are registered, what kind of help is available, and the rules of conduct on the forum. Manning’s commitment to our readers is to provide a venue where a meaningful dialog between individual readers and between readers and the author can take place. It is not a commitment to any specific amount of participation on the part of the author, whose contribution to the Author Online remains voluntary (and unpaid). We suggest you try asking the author some challenging questions lest his interest stray! The Author Online forum and the archives of previous discussions will be accessible from the publisher’s website as long as the book is in print.